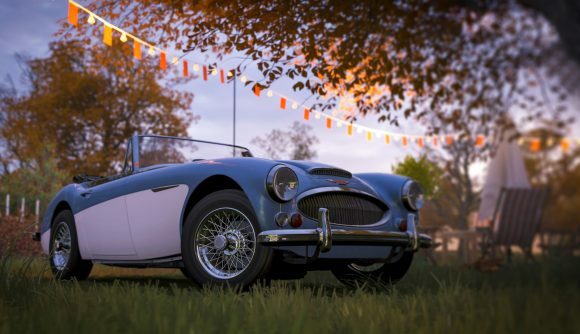 You can gain influence for doing just about anything in Forza Horizon 4 – changing your mind and pulling a sudden e-brake turn will usually net you a few points. But it turns out the easiest way to gain influence is by leaving a browser tab open. Now, that said, if you do decide to stream the game through Mixer, you wind up with some benefits – Mixer streaming nets you increased influence points, the game’s version of experience. Gaining influence means gaining levels, and gaining levels will net you specific emotes (for if you need to see the Hotline Bling performed by an idiot in Santa-themed booty shorts at Edinburgh Castle, for instance) or wheel spins, which are a much bigger deal. Wheel spins can grant you “rare” Santa-themed booty shorts (yes, I’m still salty about those), but also massive credit payouts and in many cases, rare cars. All that to say, influence points are kind of important in Forza Horizon 4. They also determine which events you’re qualified to race in, and they’re kind of the universal currency of the game. And that makes Microsoft’s Mixer benefits program pretty weird. See, you don’t just earn bonus influence by streaming Forza Horizon 4. You also can earn extra influence just by watching Mixer streams of people playing Horizon 4. You could rack up points by doing burnouts and expertly drifting hairpin turns, but the option exists to just fire up Mixer and let the points roll in – conceivably, while you’re off doing something else. What this means for the game is that it’s trivially easy to farm influence without even playing it. I’m a big Forza fan, but I have to admit that the way it deals even with screenshots is hair-pullingly irritating. This, I feel, is worse still. I can’t just stream it to my Twitch channel like a normal human being, at least not without extra hardware and a dedicated streaming PC. However, I have to admit that once I got things running in Mixer, it really does work well. I had no issues streaming at 1080p, whereas I usually have to throttle my Twitch streams to 720p due to terrible rural internet upload speeds. I’m not about to start farming influence by keeping Forza streams up and running all day, but it’s something you could do. If you want. We won’t judge you.